Free Shipping Included! Outdoor Camping & Hunting Machete Knife and Thrower Axe w/ Back Carry Nylon Case by HERO EDGE at The Net Stores Network. MPN: K1020-76SET. Hurry! Limited time offer. Offer valid only while supplies last. 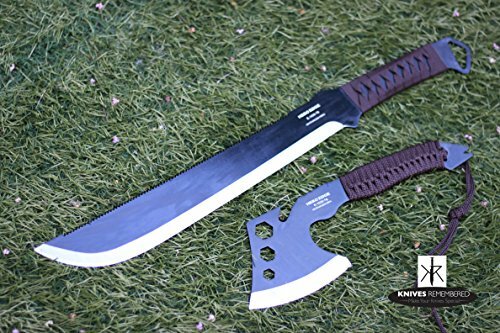 Outdoor Camping & Hunting Machete Knife and Thrower Axe w/ Back Carry Nylon Case, Machete Size: 19 inches Overall, 12 inches Blade, 5 inches Handle. Machete Size: 19 inches Overall, 12 inches Blade, 5 inches Handle. Axe Size: 11 inches Overall, 4 inches Blade, 4.5 inches Handle. If you have any questions about this product by HERO EDGE, contact us by completing and submitting the form below. If you are looking for a specif part number, please include it with your message.